Sign up for Broadjam today to follow DARIA (Daria Marmaluk-Hajioannou), and be notified when they upload new stuff or update their news! BEST-LOVED SONGS FROM THE GOOD OLD DAYS! "Best New Artist For Younger Children"
2004 - Children's Music Web Award "Best New Artist For Younger Children" This album is a classic for kids and grown-ups alike. On this album you'll find best-loved favorites such as Woody Guthrie's "This Land is Your Land" and La Bamba. 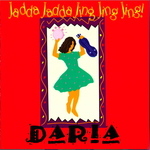 You'll go back in time to your grandparents days to hear the song "Jadda" and "Three Little Fishies". You can sing along to silly favorites such as Akin Drum and Magdalena Hagdalena, accompanied on spoons and a jaw harp. "Smart, funny, warm and witty", this album is a joy for kids of all ages from 2 months to 92 and perhaps even older!